Days of Our Lives (DOOL) spoilers for Friday, March 30, tease that Chad (Billy Flynn) will blast Stefan (Tyler Christopher) for setting him up in Hong Kong. He knew it was a bad idea for Abigail (Marci Miller) to go on that trip with his brother, so he decided to follow them. That plan obviously didn’t work out since Chad ended up getting arrested! Belle (Martha Madison) got her client off the hook and now it’s time for more strife. Back in Salem, Chad will unleash his wrath. He’ll make it clear that he’s not going to tolerate any more of Stefan’s scheming. Days of Our Lives spoilers say Stefan and Chad’s war will rev up. They’ll spar over Abigail and pretty much anything else they can think of. Chad and Stefan’s confrontation will nearly lead to some punches, but it seems someone will intervene before it comes to that. However, more drama’s still to come. At Gabi’s (Camila Banus) trial, both Stefan and Abigail will be called to the stand. Days spoilers suggest that Stefan will face accusations about framing Gabi. Justin (Wally Kurth) will try to trip up the witness, but Stefan will be quite smooth. Things could be a bit tougher for Abigail, especially since “Dr. Laura” will be in control! “Dr. 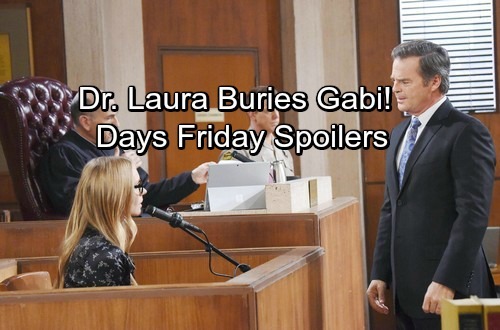 Laura” will share a shocker that makes Gabi look guilty, so stay tuned for all the DOOL chaos. 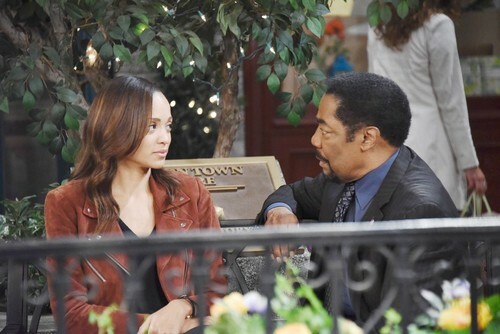 Other Days of Our Lives spoilers say Lani (Sal Stowers) will make a confession. She recently came clean to JJ (Casey Moss), but now it’s Abe’s (James Reynolds) turn to hear the truth. Lani will get emotional as she reveals her paternity deception. She’ll stun Abe when she admits she’s actually carrying Eli’s (Lamon Archey) baby. Abe will respond with compassion, so at least Lani will feel like she has someone in her corner. Over with Valerie (Vanessa Williams), she’ll have some advice for her son. Valerie will insist that Eli should be in this kid’s life. She’ll think he should stand up to Lani and fight for his rights if need be. Eli will indeed approach Lani about the issue next week, April 2-6. Despite a few hiccups early on, Lani and Eli will eventually get on the same page. Are they on the verge of a real romance? We’ll give you updates as other Days news comes in. Stick with DOOL and don’t forget to check CDL often for the latest Days of Our Lives spoilers, updates and news.